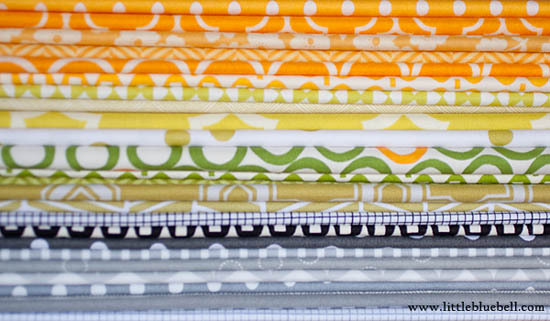 This stack of fabrics was sitting on my cutting table waiting for a turn to play. There was no plan for a quilt when I bought them, I just knew I had to have them. It happens. 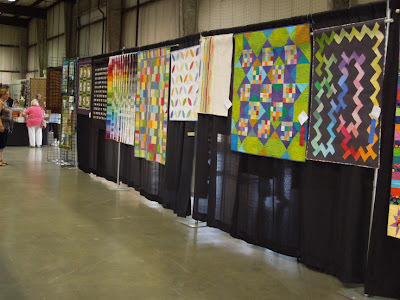 I received Liberated String Quilts by Gwen Marston in a recent guild swap. They had me at Gwen! It's packed with inspiration and I started to get an itchy cutting finger just bringing it home. Sometimes you have to start something when the mood strikes. 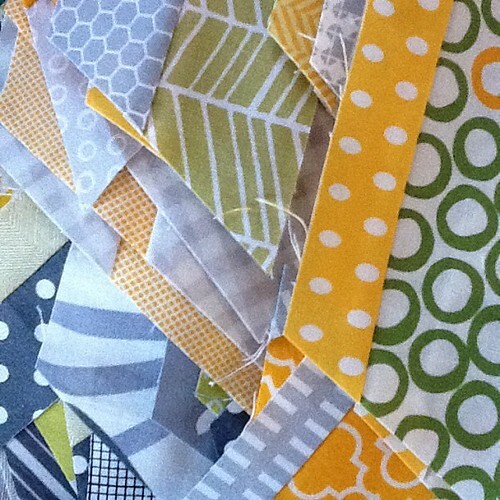 I pulled even more yellow, green and gray fabric from my stash. The more variety the better! I wanted to try a herringbone - string quilt. 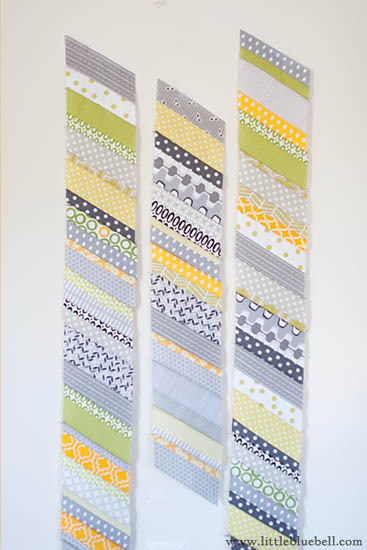 Gwen has a great version in her book called Chevron String Bars. She recommends cutting and placing your pieces in a paper bag for a random look. Try it, it's liberating! Last night I couldn't stop piecing. I kept going and going; picking up two sets of strips and running them through my sewing machine. The repetitive almost mindless sewing was just what this busy Mama needed. Since I didn't plan it out ahead of time I wasn't sure what it was going to look like put together. 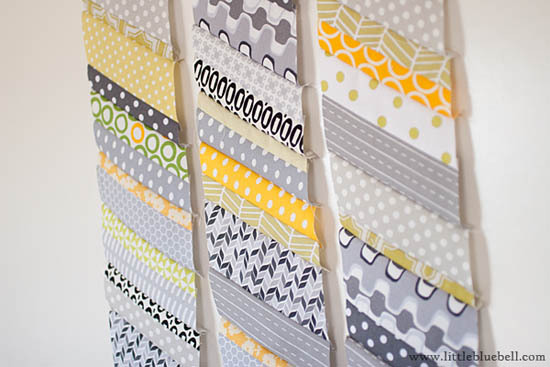 I was so excited to see these gorgeous patchwork rows emerge from the back of my machine. I still have a long way to go, but for me, right now, this is just right. 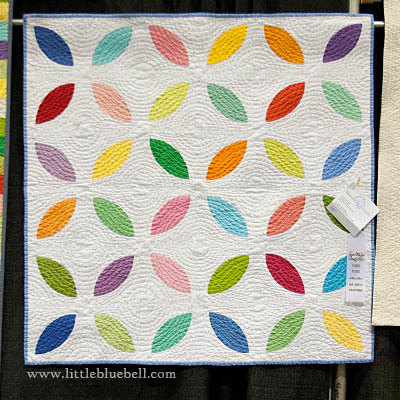 I'm overwhelmed and thankful for all the love and support for my Modern Peel quilt. Thank you so so much!! There were a few questions about the actual quilting and I will do a follow up post with some tips to help you out. Meanwhile, I have some exciting news to share with you. 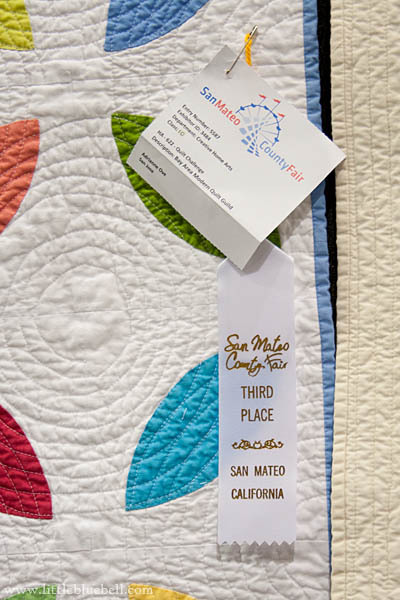 My quilt received a 3rd place ribbon at the fair. The best thing about the exhibit? There was a whole row of modern quilts!!! I am so proud of Bay Area Modern for putting a modern stamp on the community.